Author: Mykola Gordovskyy, Philippa Browning JBCA / University of Manchester and Rui Pinto LESIA/Observatoire de Paris. In the standard solar flare model, the primary energy release and particle acceleration occur in a reconnecting current sheet above the flaring loop or flaring arcade . Then, high energy particles precipitate towards the loop footpoints in the dense chromosphere, where they produce observed hard X-ray (HXR) emission and other features, such as ‘white-light’ continuum emission (in major flares), and chromospheric evaporation. However, there are two main difficulties with this standard scenario [see e.g. 2]. Firstly, the acceleration efficiency in the reconnecting current sheet needs to be very high to provide the observed HXR intensities. Secondly, it is unclear whether a return current of thermal electrons of ambient plasma can fully mitigate the effects of charge displacement caused by the precipitating electrons . Alternative scenarios have been suggested to overcome these difficulties. Some models suggest that a substantial part of the energy can be carried from the primary energy release site by MHD and kinetic waves, energising particles closer to the chromosphere [e.g. 4]; other models consider scenarios where magnetic energy release and particle acceleration are distributed within the flaring atmosphere , or even located within the chromosphere . 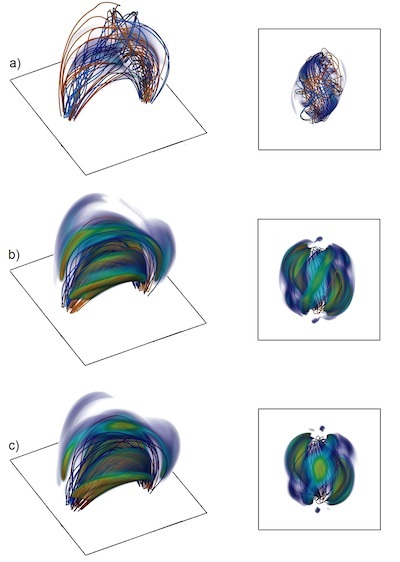 Our study proposes that magnetic reconnection occurs in a twisted coronal loop – theoretical studies show that kink instability can result in rapid energy release, more or less uniformly distributed within the twisted flux tube . This scenario is particularly attractive because magnetic twist should be ubiquitous in the corona and twisted loops are often observed in flares [e.g.7]. We are specifically interested in the observational manifestations of this scenario, in order to be able to distinguish these events using thermal and non-thermal emission. Figure 1. Evolution of the magnetic field (left panel) and current density (right panel) in typical twisted loop model. Different colours in the left panel are used to demonstrate the change of connectivity: red and blue lines are tied to opposite footpoints. We use 3D resistive MHD simulations solved by the LARE3D code  to follow the evolution of a twisted coronal loop in a gravitationally-stratified atmosphere, taking into account thermal conduction and radiation – from the onset of kink instability, through fast magnetic energy dissipation, and to formation of a new force-free equilibrium [9-10]. Then, the resulting time-dependent electromagnetic field is used to calculate particle trajectories using the relativistic guiding-centre equations and taking into account Coulomb collisions. Figure 2. Sketch showing different stages of the twisted loop evolution: onset of ideal kink instability (1-2), magnetic reconnection (3-4) and relaxation (5-6). Figure 1 shows the evolution of magnetic field and current density in a typical case. The twisted loop configuration is derived from a potential magnetic loop by twisting its photospheric footpoints. Kink instability occurs when the total twist is around 8π. The loop evolution is then determined by two different types of magnetic reconnection: twist reduction within the loop (i.e. dissipation of longitudinal current), and reconnection between the loop and ambient (non-twisted) field. The latter results in change of connectivity as shown in Figure 2, and in a noticeable loop contraction. During the reconnection, current density concentrations form filaments along the flaring loop. As a result, hot plasma is organised in fibrils approximately following magnetic fields, giving an opportunity to detect the twist. The temperature and density distributions allow us to calculate synthetic soft X-ray thermal emission, an example of which is shown in Figure 3. Interestingly, it can be seen that the visible twist is around 2π, i.e. much lower than the critical magnetic twist causing the kink instability (around 8π). There are two reasons for this: firstly, hot plasma fibrils don’t exactly follow magnetic field lines; secondly, the plasma becomes very hot (and bright) only when the reconnection is well under way and twist is already reduced. Figure 3. Thermal X-ray emission at 3keV at different stages of magnetic reconnection (a – onset of reconnection, b – near the end of reconnection, c – relaxation/cooling phase). Electron distributions calculated using the test-particle approach give an opportunity to also calculate synthetic non-thermal emission from a reconnecting twisted loop. Gordovskyy et al. show that bulk of emission comes from the chromospheric footpoint sources. These sources have one remarkable feature: they increase in size with time (Figure 4). Apparently this happens because of the reconnection between the magnetic field of the twisted loop and ambient magnetic fields: this leads to effective increase in the loop cross-section, which, in turn, results in the increasing horizontal extent of the footpoints. Figure 4. Hard X-ray bremsstrahlung at 12 keV in one of the loop footpoints (view from the top). Panels from left to right correspond to different stages of the loop evolution: onset of magnetic reconnection (left), fastest magnetic energy release (middle), end of magnetic reconnection (right). The intensity maps are smoothed with 1 Mm-wide gaussian filter. From left to right the FWHM diameter of the. HXR source increases from 1.2 to 1.7 Mm. Our numerical models provide two remarkable observational features, which should be observable in reconnecting twisted coronal loops (see [10,11] for more details). Firstly, we predict a ‘twisted’ pattern in thermal emission (EUV or SXR). However, the twist should be around 2π, i.e. much lower than the critical twist required for kink instability. This is consistent with observations: the twist angle visible in EUV is normally about few π. Secondly, the flaring loop should have expanding cross-section, which should be visible as a gradual increase in the horizontal size of HXR footpoints. Brown J.C., Turkmani R., Kontar E.P. et al. 2009, A&A, 508, 993. Zharkova V.V. & Gordovskyy M. 2005, A&A, 432, 1033. Reames D.V., SSRv, 175, 53. Cargill P.J.., Vlahos L., Turkmani R. et al. 2006, SSRv, 124, 249. Browning P.K., Gerrard C., Hood A.W., 2008, A&A, 485, 837. Srivastava A.K., Zaqarashvili T.V., Kumar P. et al. 2010, ApJ, 715, 292. Arber, T.G., Longbottom, A. W., Gerrard, C. L. 2001, JCompPhys, 171, 151. Gordovskyy M. & Browning P.K., 2011, ApJ, 729, 101. Gordovskyy M., Browning P.K., Kontar E.P. et al. 2014, A&A,561,72. Pinto R.F., Vilmer N. & Brun A.S., 2014, arXive preprint 1401-0916.